Portable Solution Package – Katrin Field Inc.
Imina Technologies Portable packages enable to take full advantage of the versatility, compactness and ease-of-use of the miBot™ piezoactuactued mobile robots. The whole system features up to four manipulator allowing you to independently position the probes over millimeter scale samples with a resolution down to a few tenth of nanometers. The platform accommodates samples up to 5 cm (2”) diameter. 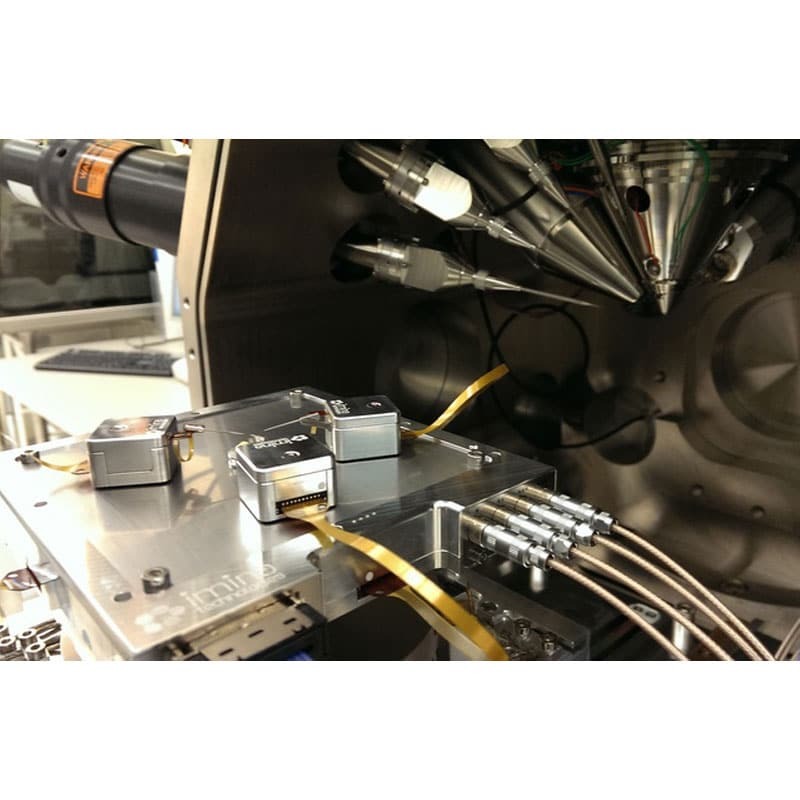 Specially designed to be extremelly fast to install, it offers several mounting interfaces that fit most optical and electron microscopes (SEM), and moving from one to another is a matter of minutes. An aperture centered on the robot platform fits various types of SEM stubs, letting you observe the specimen just like you are used to. The miBot stage embeds a MultiBot controller which allows you to run up to 4 miBots with a single piezo driver (syDrive SD-10) and cabling is reduced to the minimum. Electrical signals can be measured or injected at the miBot probe tips by third party instruments by connecting them to the coaxial connectors on the front panel of the platform (miBase BS-43). Ideal for labs with shared equipment, a Portable package system fits a suitcase for convenient transport and storage. Versatile. 4 manipulators, 1 platform, multiple microscopes. Faster experiments. Observe, prepare and characterize your samples at once. Hassle-free probe positioning.Instantly adjust the orientation to any sample geometries. High mechanical stability. Move without vibration and maintain steady electrical contacts.